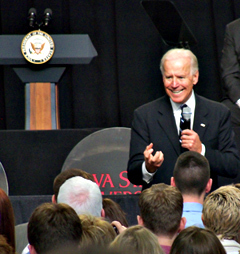 Vice President Joe Biden makes a point while talking in Ames on March 1st. Vice President Joe Biden will make his second trip to Iowa this month when he makes stops Wednesday in Davenport and Sioux City. Iowa Congressman Dave Loebsack, talked with reporters on a conference call about his fellow Democrat’s visit to the company called PCT Engineered Systems. “I understand he will address the president’s commitment to essentially creating an economy built to last, which does outbuild and out innovates really the rest of the world, and that’s what this is about folks,” Loebsack says. This is a campaign visit, and the announcement from the Obama/Biden campaign said Biden’s speech will show the administration’s “strong record is in stark contrast with Mitt Romney and Republican candidates.” Loebsack, is a Democrat from Iowa City who is seeking re-election. He says this is the second of a series of three speeches the vice president is making on the manufacturing industry. “If we’re going to strengthen the middle class and grow the economy, we’ve got to focus on the manufacturing sector, which as we know plays a critical role in our economy, especially right here in the Quad Cities,” Loebsack says. The campaign announced this morning that the vice president will be making a stop in Sioux City after leaving Davenport to meet privately with “grassroots supporters.” The vice president visited Iowa State University on March 1st where he touted the technological research going on at the school.